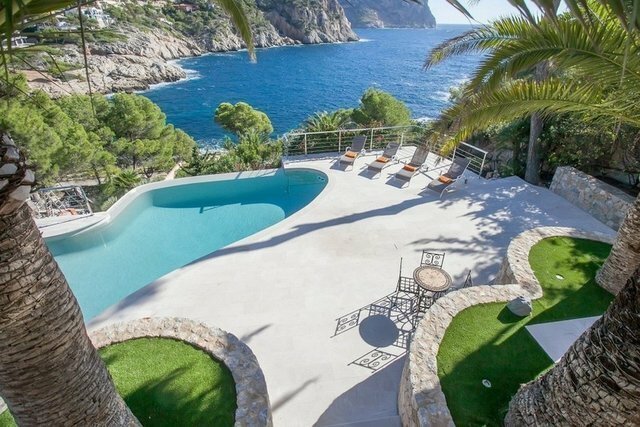 Situated in a dream location in front of the sea in the exclusive residential area of La Mola, this magnificent villa offers stunning views over the tranquil bay of Cala Marmassenand is just 10 minute away from the vibrant and cosmopolitan Port Andratx. Private access to the sea , private boat dock and mooring is via a few flights of steps through mature, terraced gardens or via a funicularé lift which runs from pool level to the roof of the old boat house. The interior space of 1,100sqm offers beautifully appointed accommodation distributed over 4 floors. Exterior spaces include 5 entertainment terraces offering a choice of private, intimate spaces (jacuzzi terrace and the adjoining chill out terrace with wet bar,WI-FI, Sonos system) plus larger communal areas (bbq dining terrace, upper solarium, pool terraces and the boat house terrace) as well as plenty of shaded areas within the garden terraces leading down to the sea.